Marina Gatell Poch (b. Sabadell, Catalonia, Spain; July 11, 1979) is a Spanish actress. Sabadell is the fifth largest city in Catalonia, Spain. It is in the south of the comarca of Vallès Occidental and its joint capital, on the River Ripoll, 20 km (12 mi) north of Barcelona. Sabadell is located 190 m (620 ft) above sea level and is the co-capital of the comarca. Catalonia is an autonomous community in Spain on the northeastern corner of the Iberian Peninsula, designated as a nationality by its Statute of Autonomy. Catalonia consists of four provinces: Barcelona, Girona, Lleida, and Tarragona. The capital and largest city is Barcelona, the second-most populated municipality in Spain and the core of the sixth most populous urban area in the European Union. It comprises most of the territory of the former Principality of Catalonia. It is bordered by France (Occitanie) and Andorra to the north, the Mediterranean Sea to the east, and the Spanish autonomous communities of Aragon to the west and Valencia to the south. The official languages are Catalan, Spanish, and the Aranese dialect of Occitan. Maximum Shame is a feature-length dystopian movie, written and directed by Carlos Atanes and released in 2010. 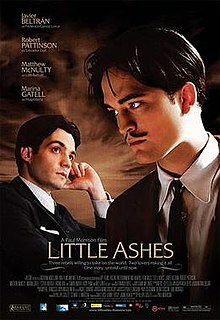 Little Ashes is a 2008 Spanish-British drama film set against the backdrop of Spain during the 1920s and 1930s, as three of the era's most creative young talents meet at university and set off on a course to change their world. Luis Buñuel watches helplessly as the friendship between surrealist painter Salvador Dalí and the poet Federico García Lorca develops into a love affair. Va a ser que nadie es perfecto is a 2006 Spanish comedy film. The story follows a peculiar friendship among cripples. Lalola was an Argentine television comedy show that aired from 28 August 2007 to 29 April 2008. It was broadcast by TV channel América 2. It starred Carla Peterson and Luciano Castro as protagonists. A zoo is a facility in which all animals are housed within enclosures, displayed to the public, and in which they may also breed. Ventdelplà was a Catalan TV series that was aired on TV3. It was created by Josep Maria Benet i Jornet and 365 episodes were aired between 2005 and 2010. This article about a Spanish actor or actress is a stub. You can help Wikipedia by expanding it. Club Deportivo Saski-Baskonia, S.A.D., commonly known as Saski Baskonia and as Kirolbet Baskonia for sponsorship reasons, is a professional basketball team that is based in Vitoria-Gasteiz, Spain. The team plays in the Liga ACB and the EuroLeague. David Davis Cámara is a Spanish retired handball player who played mainly for BM Valladolid and BM Ciudad Real and current coach of the Egyptian national team and Telekom Veszprém. The Prix Iris is a Canadian film award, presented annually by Québec Cinéma, which recognizes talent and achievement in the mainly francophone feature film industry in Quebec. Until 2016, it was known as the Jutra Award in memory of influential Quebec film director Claude Jutra, but Jutra's name was withdrawn from the awards following the publication of allegations that Jutra had sexually abused children. Grand Production, formerly known as ZaM or Zabava miliona, is a Serbian record label and production company predominantly focused on folk performers. The label produces the weekly television show Grand Parada, launched their own cable television channel, and organize a competitive festival of pop-folk and turbo-folk music, Grand Festival. The Clarín Entertainment Awards or simply the Clarín Awards is an award program that have taken place in Argentina since 1998. Sponsored by the Argentine newspaper Clarín, the event honors Argentine achievements in entertainment, sports, literature, and advertising. City Records is a Serbian record label. Nikola Karabatić is a male French handball player for Paris Saint-Germain and the French national team. Cosiri Rodríguez Andino de Dionicio is a retired volleyball player from the Dominican Republic, who competed for her native country at the 2004 Summer Olympics in Athens, Greece, wearing the number #15 jersey. There she ended up in eleventh place with the Dominican Republic women's national team. 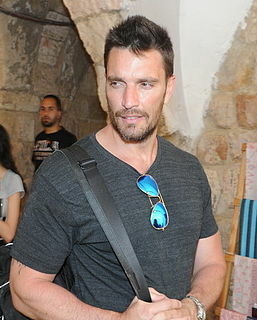 Julián Elías Gil Beltrán is an Argentine-born Puerto Rican actor, model and TV host. María Eugenia Rita better known by her stage name María Eugenia Ritó, is an Argentine dancer and supervedette. Elizabeth Cervantes is a Mexican actress of films and soap operas. She studied acting in Casa del Teatro and Centro de Formacion Actoral of TV Azteca. Javier Pereira Collado is a Spanish actor. He won Goya Award for Best New Actor for his performance in Stockholm (2013) at the 28th Goya Awards.